"I spent three weeks of this past summer in the small town of Paete in Laguna, conducting a series of lectures to parents and teachers in the town's three public elementary schools." This is the first sentence of an article that was published in the Philippine Star, and later included in the book, "Selected Essays on Science and Technology for Securing a Better Philippines". Education primarily involves children. Quality education does require a voice from research and expertise. However, the hearts of those who have their future at stake likewise need to be included. 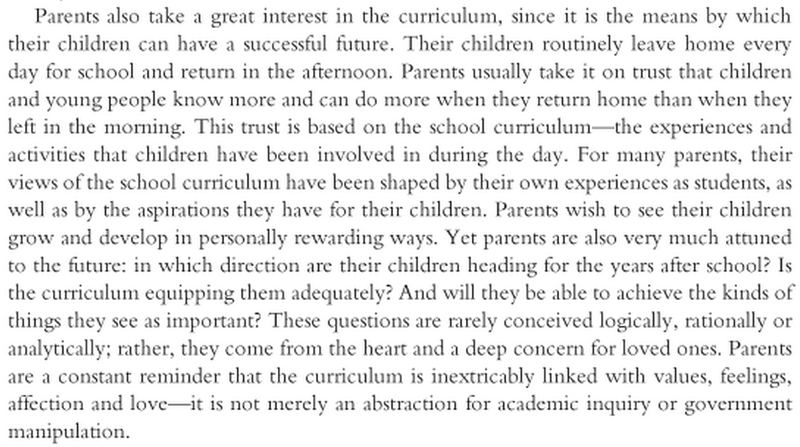 "Parents are a constant reminder that the curriculum is inextricably linked with values, feelings, affection and love - it is not merely an abstraction for academic inquiry or government manipulation." The importance of parents' participation and consultation on education can not be overstated. "Sometime in September 2011, K to 12 was being discussed in Mapsa EduPh (Manila Archdiocesan and Parochial Schools Association) Annual Convention in Immaculate Conception Parish in Cubao, Quezon City. I was there representing my children's school's parents association, being the president. The cluster is supposed to be a group for PTAs and the topic was K to 12. There were around 200 participants. 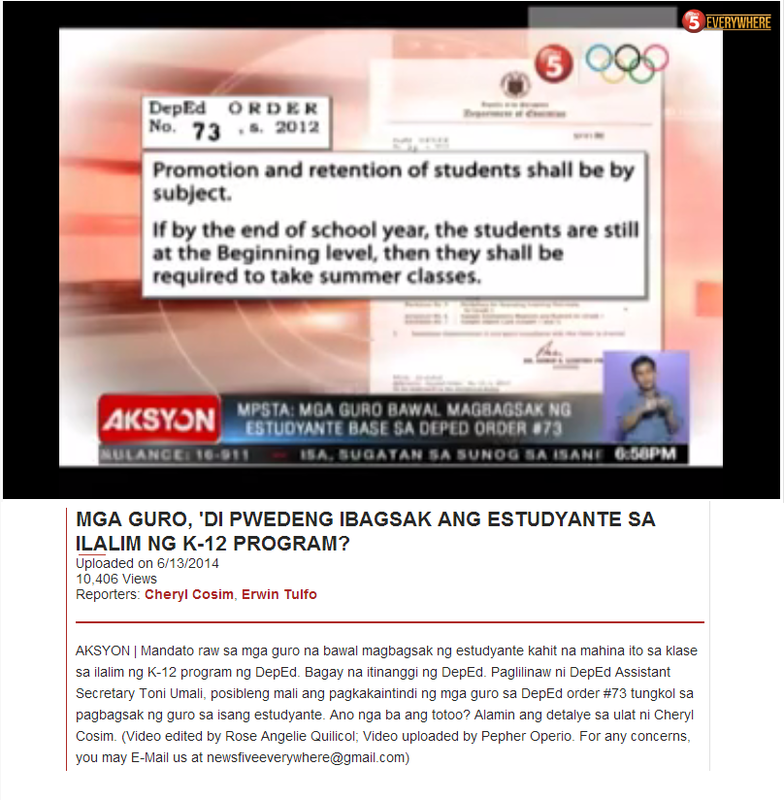 The speaker was from DepED. During the open forum, I asked who among the participants were parents, and I was surprised to see that there were less than 5 among us who were PTAs. I asked the speaker on how they consulted the parents, and the answer was through a "public hearing". I asked if there was an organized parent group who represented them. Obviously, there was none. Msgr. Gerry Santos, who was then the chair intervened and acknowledged that parents were supposed to have been asked about the program. He continued by challenging the parents to come up with their advocacy concerning the issue." I think it is actually straightforward to see which side of the story is true. If parents were indeed consulted, such question would not be a frequently asked question. Interesting article, and parents certainly need to be included more in the education process. I still don't think that's going to close the gap with the serious problems (around the world) with public school though. In the Philippines 1/3 children drop out in Elementary School, and of those who reach High School a further 1/3 drop out before graduating. Firstly, because it's too expensive. It costs between P15k-20k per year in uniforms, project materials, miscellaneous fees, etc. and for a family living in poverty that means they have to spend half of their income on sending three kids to school. That's why families specialise with several kids working, one or two going to school as the long-term hope of the family, and the older kids looking after the younger. Beyond that, though, the education system places no value on students. If parents aren't involved in decision-making in the schools, than neither are students themselves. In that sense there is fundamentally no decision-making process. What a child wheres, when they go to school, what they learn, how they learn it, who they learn it from, and whether or not they can go to the bathroom, is all prescribed by the school itself. 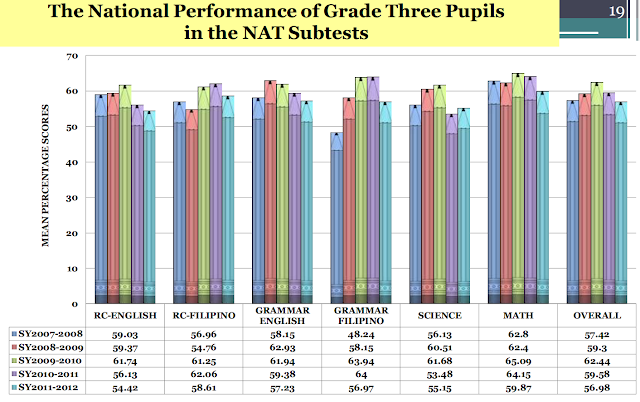 The curriculum isn't Filipino, it copied the American system, which copied the European system, which copied the Prussian system. And if you were to design the ideal environment for learning, based on current research about how children learn best for the ideal environment for developing happy children who were studying well for both EQ and IQ subjects, we would keep practically nothing from the current system. If you were to design an environment for making children into factory workers, into conforming, obedient citizens (as the original version of universal education was designed to do) than you could almost all of it. I think that shows the purpose well in a short sense. I wrote a series of articles on that btw I've linked below if you wanted to read and discuss.